It’s hot here. Crazy hot. Melt your face off hot. Can-only-be-out-in-it-for-12-minutes-or-I’m-going-to-suffer-heat-exhaustion hot. You basically have to either be acclimated to it – which I can do, with some training – or you basically have to run from air conditioned building/car/store to air conditioned building/car/store. My sweet husband warned me, “It’s hot. Hot like you’ve never known.” Come on honey, I like it warm! I like the humidity! It’ll be fun!! As such, you’d think there would be ice and icy drinks everywhere. Nope. I can’t find a cube to save my soul. Even at the mall I have to strongly coerce them to give me more than 3 pathetic cubes, and then they laugh like I’ve asked them to put ketchup in my soda. The hotel has no ice machines. Is that legal? But hilariously, I have been provided both gin and tonic in my minibar. WITH NO ICE? Puh-leeze. My beloved ice machine broke 3 days later. And 4 days later, there it remains, sadly disconnected from any water source. One room-temperature water for me, please. 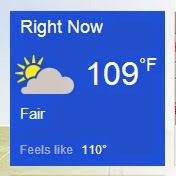 Trust me, it doesn't feel like 110, it feels like 100 million.